Here are some useful tool organisation hacks for your workshop and garden shed. We’re all striving for an efficient and well-organised workshop. Every garden shed and workshop owner’s ability to organise their tools will save them time, energy and money in the long run. If you know where your tools are, you won’t waste time looking for them, or worse, waste time and money replacing them. Get your shovel, brooms and handyman tools up off the ground with our Hanging Tool Holder. It slots easily over your EasyShed workshop or shed wall before you attach the roof. 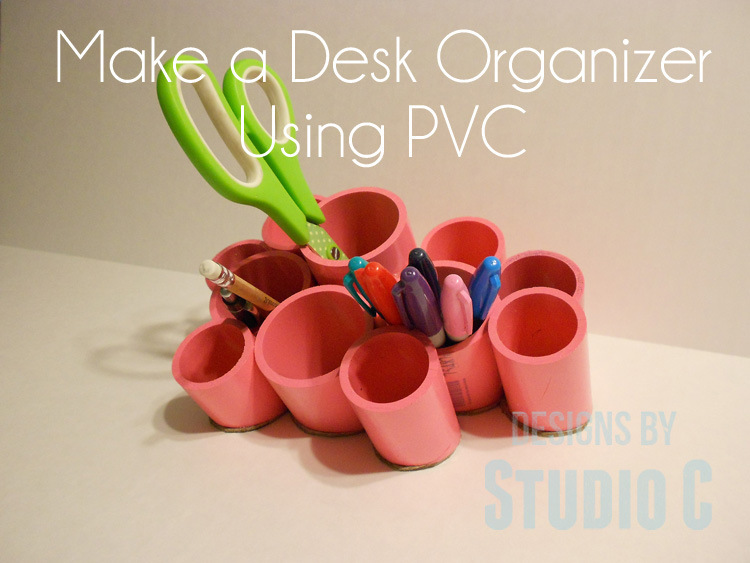 PVC pipes are cheap, lightweight and easy to cut to size, so you can customise to fit your tools. Keep your smaller hand tools within reach with a DIY rotating tool holder. Perfect for keeping on your workbench. The ultimate lazy susan for your workshop. Create a tool holder for your cordless drills with a built-in charging station! Convenient, useful and organised, what more could you want? Convert a tie or belt rack into an instant tool holder for your wrenches. Screw it to the wall over your workbench for easy access, and voila! Instant tool holder for your wrenches that you can access anytime. Another easy and inexpensive idea to get your tools organised – Peg Boards! 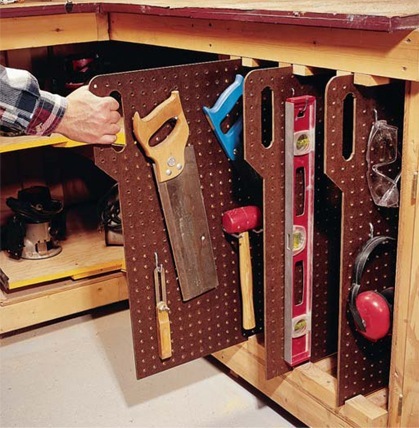 Keep your garden shed or workshop orderly by hanging tools on peg boards slides. 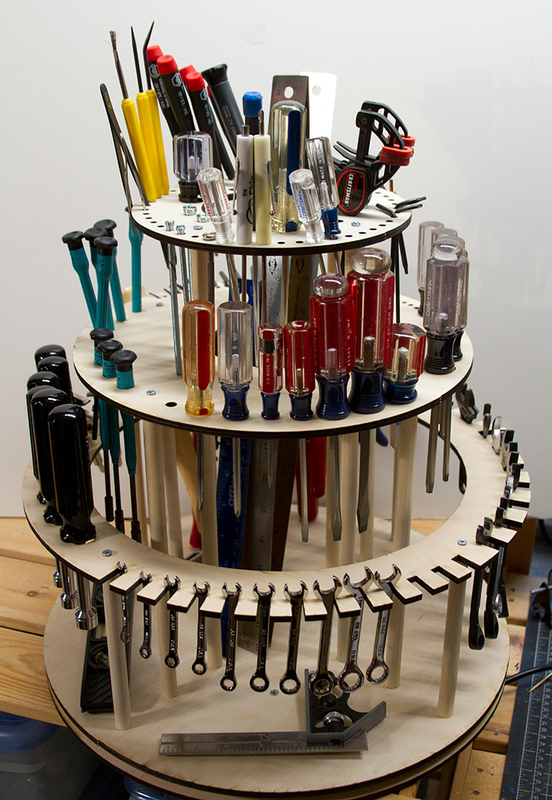 By storing tools vertically it’s also a great way to save space. Magnetic Strips are easy to find and a simple solution to get your hand tools up off your bench space. Mount them on your wall, and they securely hold your metal tools and utensils in place. They also work great as a paintbrush rack, preventing bristles from being damaged and allowing them to dry properly. 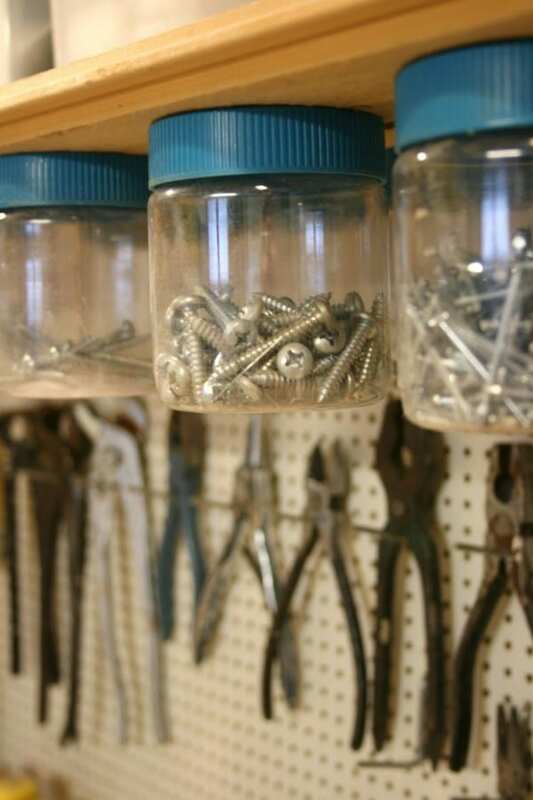 Use up all the space under your shelves by hanging jars for your screws, bolts and nails. By mounting them with a screw or two through the lid, you have easy access to the contents by simply unscrewing the jars. Reduce your cord clutter by using a hook and chain system. This is great for garden hoses, bulky electrical cords and ropes. These tool organisation hacks will make life in your outdoor shed or workshop more manageable, and allow you to focus less on cleaning up and more on DIY. Browse our range of Truss Roof Workshops. Customise your workshop with windows, skylights and tool holders. 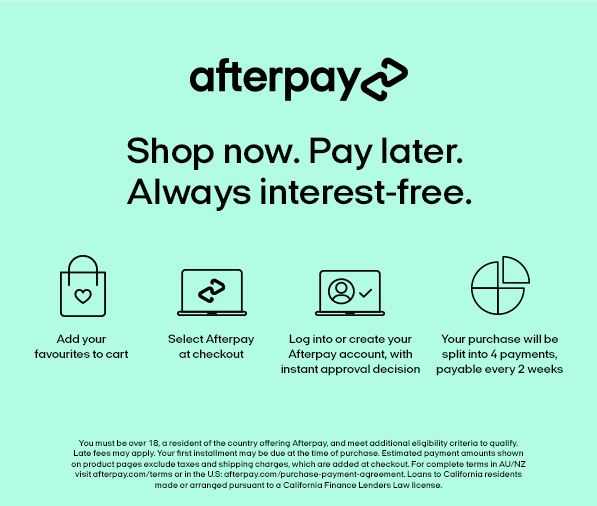 There are also bigger options for you to choose from. Go ahead and customise your EasyShed Workshop today!